The former Chilliwack Chief reflects on the last time the team played in the junior A championship. Anthony Vincent recently said that his two year BCHL career seems like its gone by in two weeks,a nd Jeff Tambellini can relate. It’s been 15 years since the Calgary native played junior A hockey in Chilliwack, but it seems like only yesterday that he was leading the Chiefs into the semi-final of the 2002 RBC Cup in Halifax, Nova Scotia. “There’s part of me that feels like it was a long time ago and sometimes it does feel like it was just yesterday,” he said. “I was very fortunate to play on a great team where they were even better people than they were players. Looking back, it’s one of the closest groups I’ve ever been a part of and the memories we have, even though it’s been a lot of years, they still hold pretty strong. Tambellini’s Chiefs were the last Chilliwack team to play in the national junior A championship, back when Victoria was the Salsa, Langley was the Hornets and the league had still had teams in Quesnel (Millionaires) and Burnaby (Bulldogs). Tambellini was just 17 years old then, but he led the Chiefs with 46 goals and 117 points in 34 games, video game numbers in any era. A deep team forward corps included the likes of Micah Sanford (59-47-58-105), Matt Gibbons (60-28-73-101), David Van Der Gulik (56-38-62-100) and Gabe Gauthier (50-37-62-99). Twenty year olds Mark Woywitka and Jeff Barlow led the defence, with current Langley Rivermen head coach Bobby Henderson providing 235 penalty minutes worth of toughness. 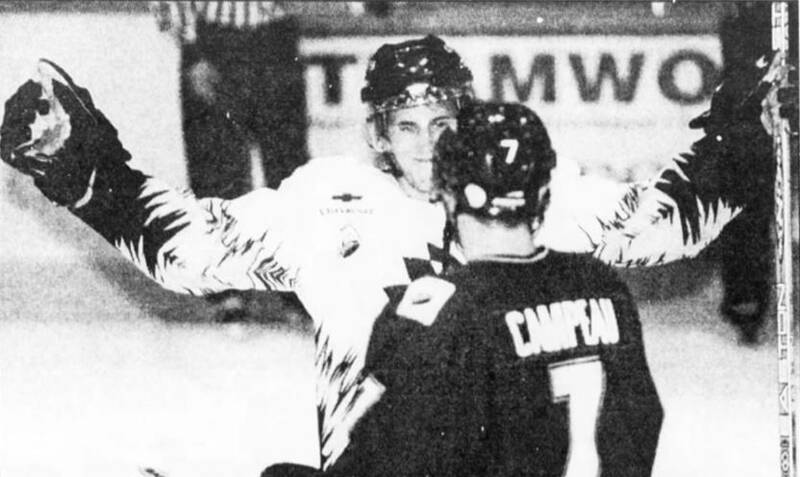 Late season addition Tyson Motz and 19 year old Marc Narduzzi tended net for a team that could play any style of hockey, overwhelming opponents with skill or grinding them to dust with a physical style that might get them arrested for assault and battery in modern times. “We were like brothers. Just like brothers there was great internal competition, which brought the best out of our group,” Tambellini said. “I think we practiced harder than some of the games we played just because everyone wanted to play and compete and have success. We had such a drive on the inside and we’d end up beating teams 8-1, 9-1 because both power play units wanted to go out there and have success. The Chiefs rolled through the regular season, setting franchise records for wins (46) and points (96). Their 341 goals in 60 games was 50 more than the next highest-scoring team from Cowichan Valley. But Tambellini said it wasn’t what happened on the ice that made that team special. It’s how they were off the ice. Looking back, Tambelli said that was spot on and it started wth head coach Harvey Smyl. Chilliwack didn’t have a clean run through the playoffs. The Chiefs dispatched the Coquitlam Express in five games, followed by wins over the South Surrey Eagles and Nanaimo Clippers. But Tambellini recalled his team falling behind 2-0 in the BCHL final against Vernon, the first true adversity they’d faced. “The whole province counted us out,” Tambellini said. After coming back with four straight wins to beat Vernon and capture the third league championship in franchise history, Chilliwack went on to the Doyle Cup where they again found themselves in a 2-0 hole against the Alberta champion Drayton Valley Thunder. “That was another tough series, and going back to back with two hostile environments against two really tough teams, we came into the RBC Cup pretty banged up,” Tambellini recalled. After losing the RBC Cup opener, 4-3 in overtime to Halifax, Chilliwack produced three straight wins to make the semi-finals where their dream season finally ended with a 4-3 loss to the OCN (Opaskwayak Cree Nation) Blizzard. “We felt going into the tournament that we had a good chance, but when it’s down to one game anything can happen and that game didn’t go as planned,” said Tambellini, who won the Roland Mercier Trophy as RBC Cup MVP. “Before you knew it we were out of the tournament and a whole year’s worth of planning was down the drain. Tambellini just retired from pro hockey in September. His final season, in 2016-17, was split between Swedish Elite League clubs Vaxjo and Djurgardens, and now he’s settling into a new life as a student and an assistant coach at the University of Michigan, working toward the Master of Business Admin degree he never finished in 2005. He doesn’t talk to his former Chilliwack teammates often, but when he does he’s reminded just how much fun that period in his life was. This is a man who has played in a Stanley Cup final (2011 with Vancouver) and won a championship in Europe. But the 2002 RBC Cup is right at the top when he considers his cherished hockey moments, and he hopes the Chiefs who take to the ice in this year’s RBC Cup appreciate how special the experience is. “I’d tell them to appreciate what the tournament is, especially as the host team,” he said. “Everybody who gets into the tournament has a chance to win this, and if you can get a little momentum behind your team you become a national championship.